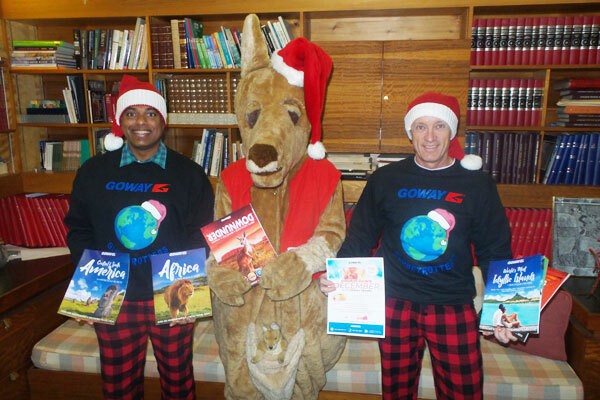 Goway wants to wish the travel industry a Merry Christmas and Merry Marsupial! Goway’s Aubrey Schmidt, Sam Cottar and kangaroo mascot Skippy were spreading Christmas cheer Thursday, with Cottar and Schmidt sporting new sweatshirts that has a Santa hat on an image of the planet and which read Goway Globetrotters, a reference to the tour operator sending people to every part of the planet, with the exception of North America and the Caribbean. “We’re pretty much covering the globe,” Schmidt said during a visit to Baxter Media’s Toronto office. Meanwhile, Goway is promoting 28-day stays on Australia’s beach destination Gold Coast that has a $3,619 lead-in price for Vancouver departures for February and March. The rate includes a stay in a self-contained condo, a welcome package, comprehensive medical insurance and return condo transfers. Rates are available for departures from other cities as well. Goway is also promoting its Double Down December that enables agents to earn double the cash on their Goway Visa Reward card for all bookings made in December. It offers $10 per passenger for air-only bookings, $20 per passenger for land bookings, $30 per passenger for air-land bookings, $200 per deposited group and $100 per departed group for group (travel any date) bookings and $100 per passenger for a round-the-world air-only itinerary. “It’s like a Christmas gift for agents,” Cottar said. Pictured are Cottar, Skippy and Schmidt.